And so we arrive at the third part of our little odyssey. 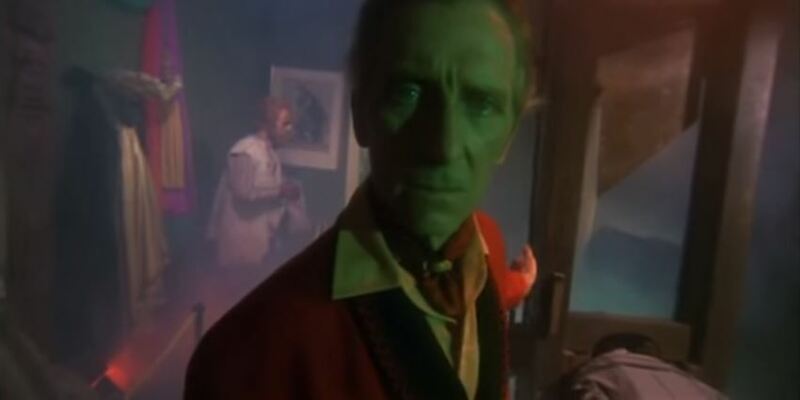 Remember when we first started back in the 1960s with Dr Terror and the Torture Garden? That was fun, wasn’t it? Picking out those few cravats amongst the more fashionable skinny ties? And that’s if for Asylum. 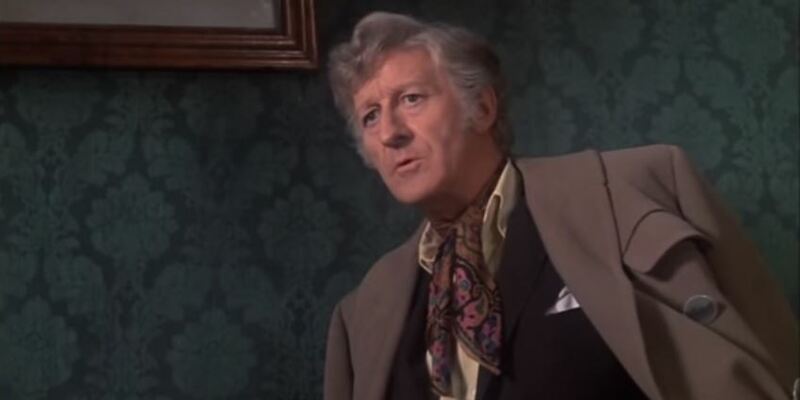 A single cravat! It’s madness, I tell you. Madness! 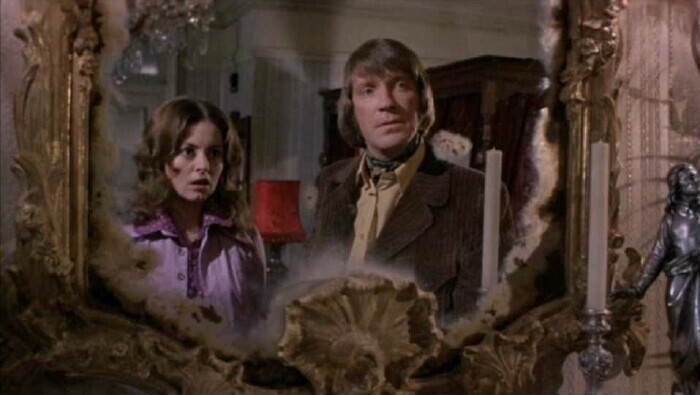 In the same year Amicus gave us Tales From The Crypt and it must have been due to the great cravat drought of 1972 or something because, again, they’ve virtually disappeared. 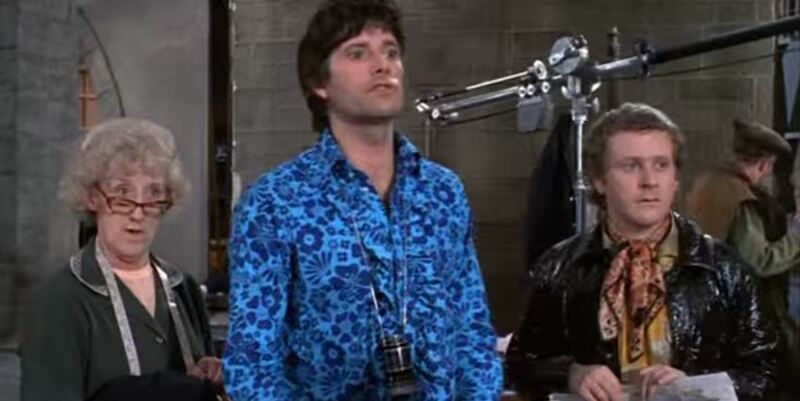 But then, just when you think it’s all over, we get close to the end of the final segment and, you have to be quick to catch it, but we get two cravats in a single scene. 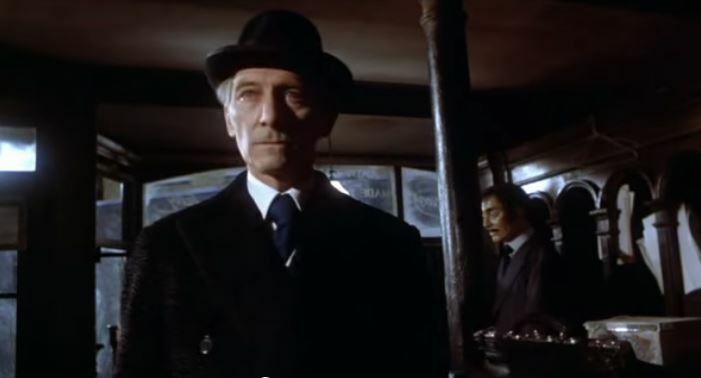 Nigel Patrick in the foreground wearing a rather limp affair, not much better than Cushing’s napkin, and the old blind chap right at the back. Well, I’m afraid that’s it for 1972. All I can do is offer my sincere apologies for today’s rather bleak installment. 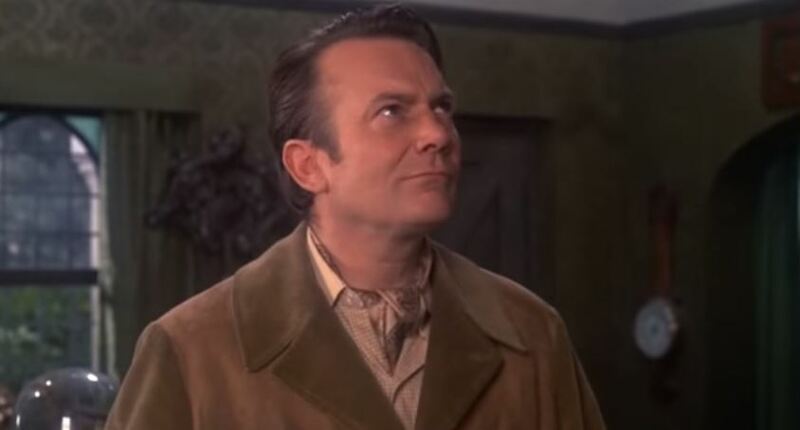 Join me next time for the final two films in the series and a promise of a more substantial cravat count. So then, as you can see, we dealt with the 1960s in the first post. 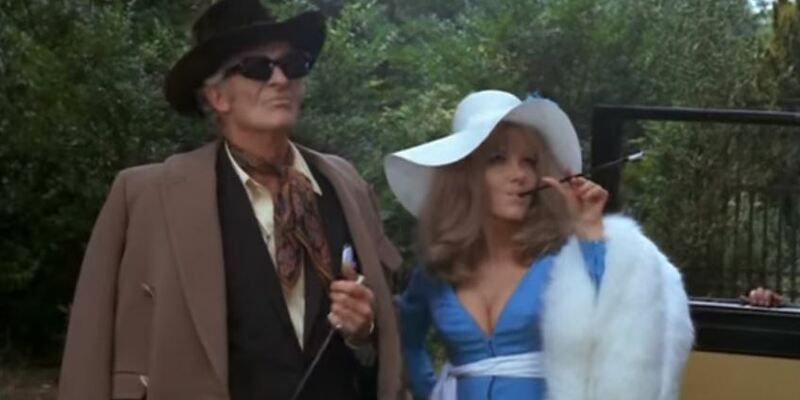 This brings us slap bang into the cravat revival period of 1971. 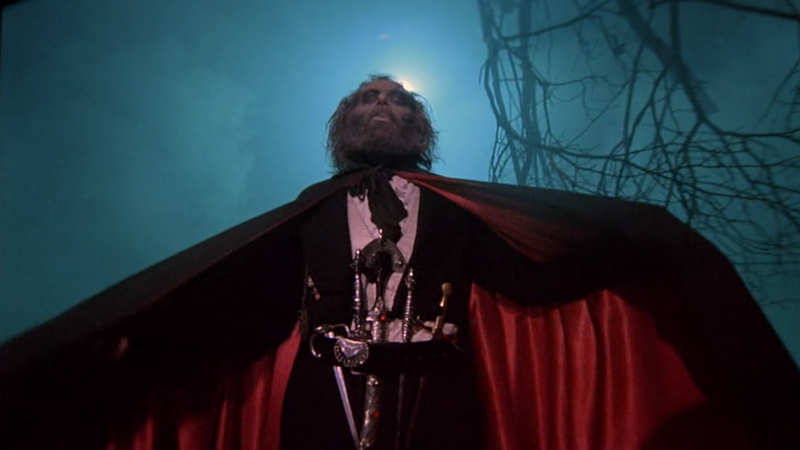 Unlike the other Amicus portmanteau films, there is no central villain of the piece. The four tales revolve around the various inhabitants of a lodge house which is up for rent by A.J. 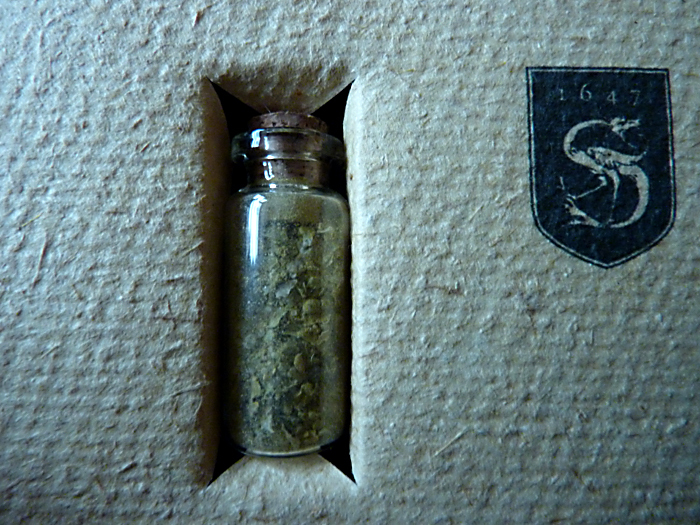 Stoker & Co. (we don’t have to think too hard for that allusion). 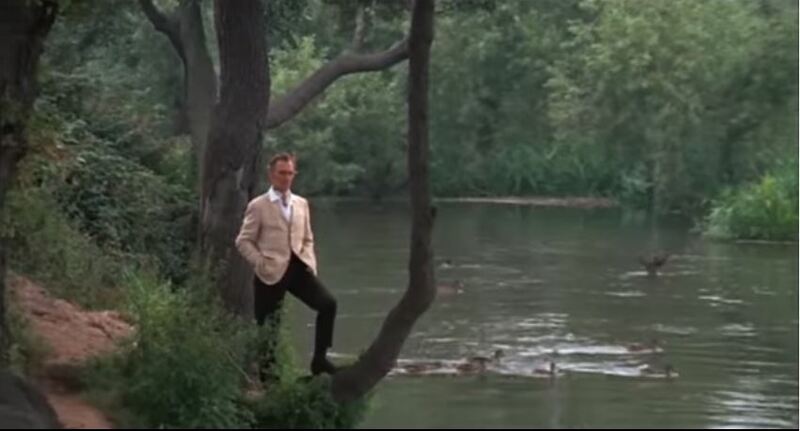 As you will see, the cravats fly free in this film! The second segment is a joy for the cravatier. 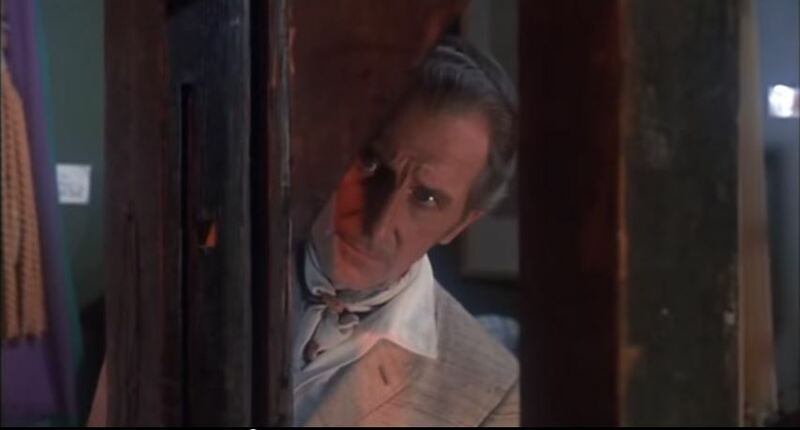 It stars that unabashed cravatophile, Peter Cushing. 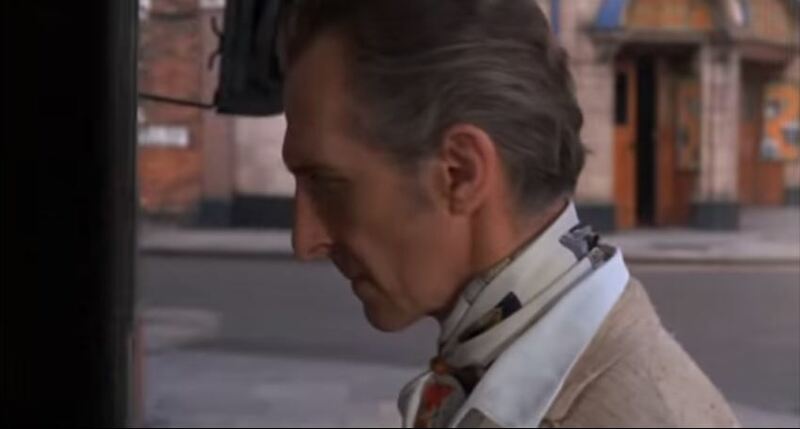 No one carries off a cravat like Cushing! And no old knot will do for his characteristic silk, he threads his through a gold ring to hold it in place. 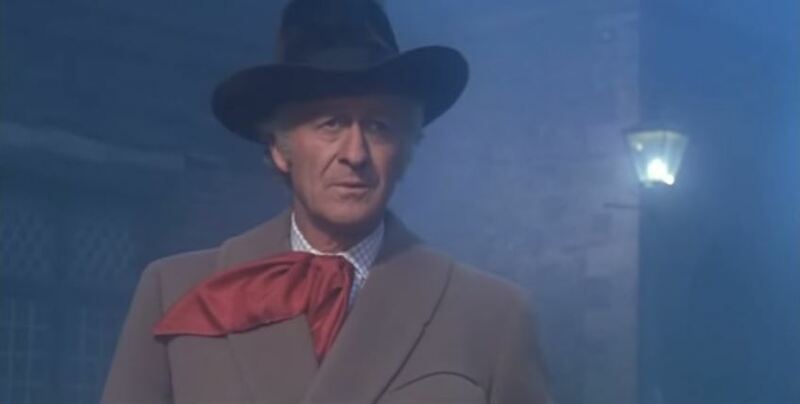 But imagine the embarrassment of entering the Waxwork Museum in the small Surrey market town to find the proprietor (Wolfe Morris) emulating your style of cravat fastening! This would be enough to give any chap a fit of pique. 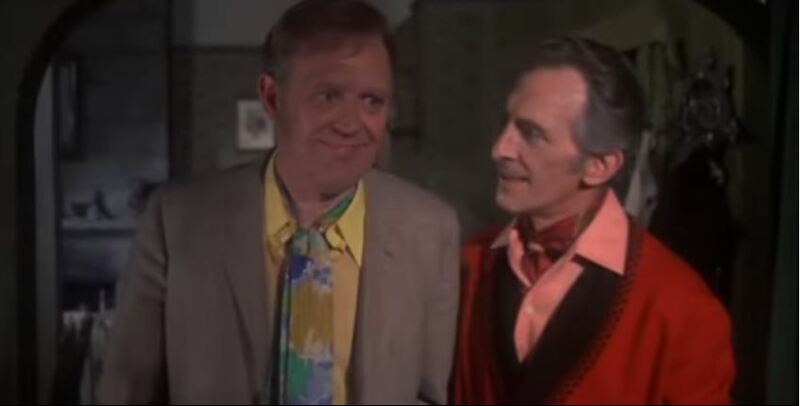 Even the supporting actors in this segment don’t miss out on the cravat wearing. And that’s it for this time, cravatiers. 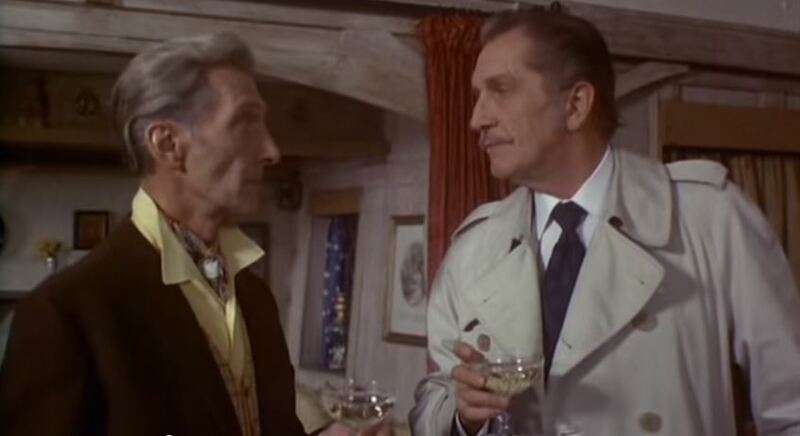 The House That Dripped Blood must be in the running for the most cravat saturated film of all time (not counting those period pieces set pre-20th century, that’d be cheating). Join me next time as we continue our journey further into the 1970s with a visit to the Asylum! 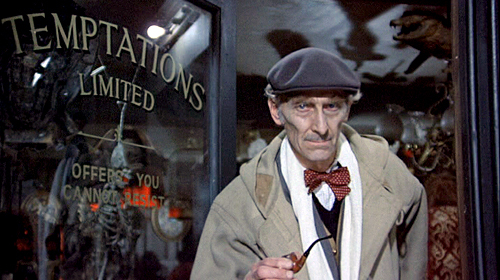 For the uninitiated, Amicus was a British film production company which began life in 1962 and ended in 1977. Those fifteen short years took in the best parts of the ’60s & ’70s. 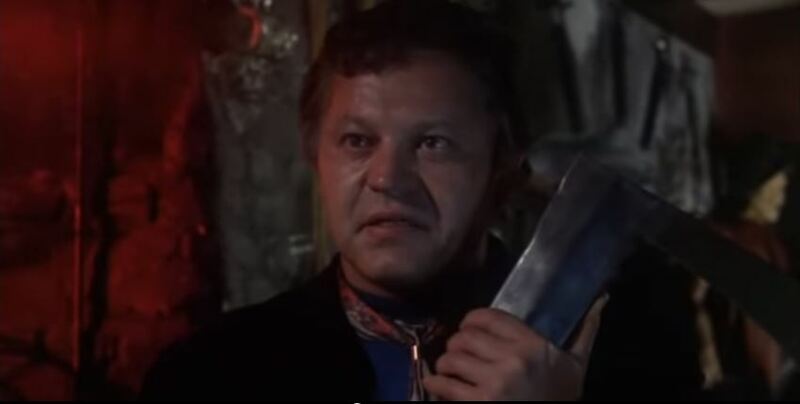 The company was run by Milton Subotsky and Max Rosenberg and, being inspired by the 1945 Ealing horror film Dead of Night, they produced several of their own films in the same style. It was these ‘portmanteau’ films that they became most famous for. 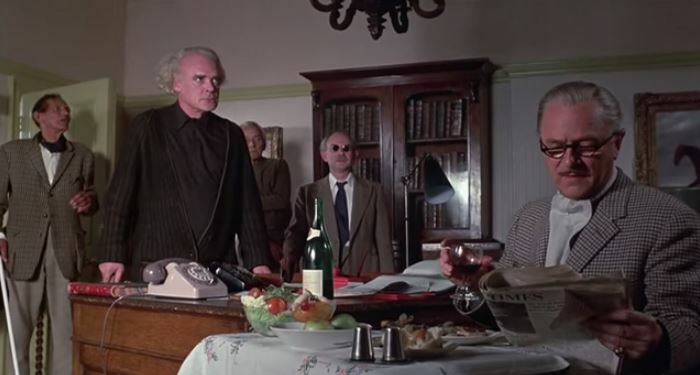 What interests us here though, apart from how utterly brilliant the films are, is the preponderance of cravats we see through the seven films. 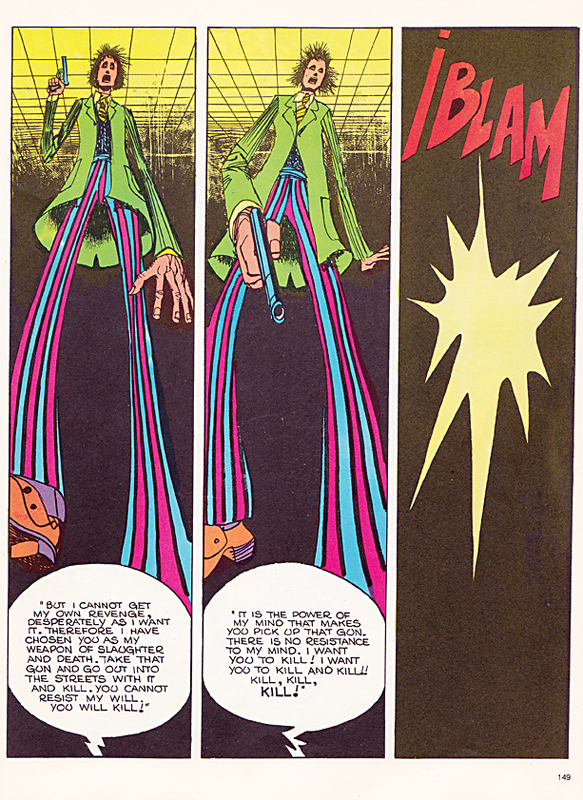 Ok, their appearances start off slowly but they build to quite the crescendo in the early ’70s…as we shall see. This is Part 1, in which we shall examine the first two films. 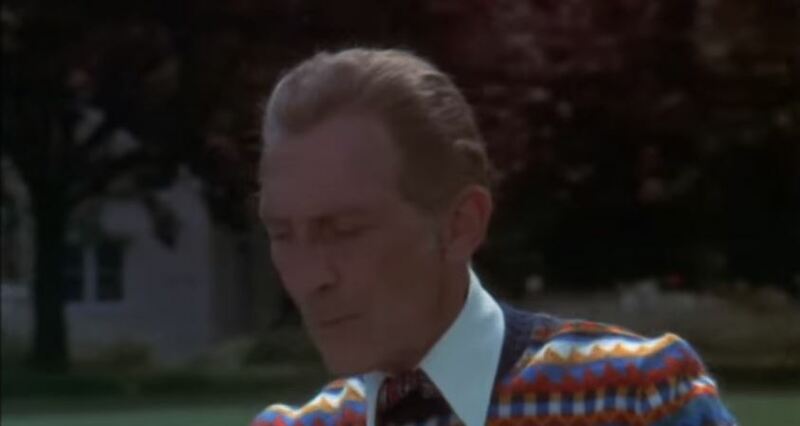 However, we do still have the occasional glimpse of a cravat. 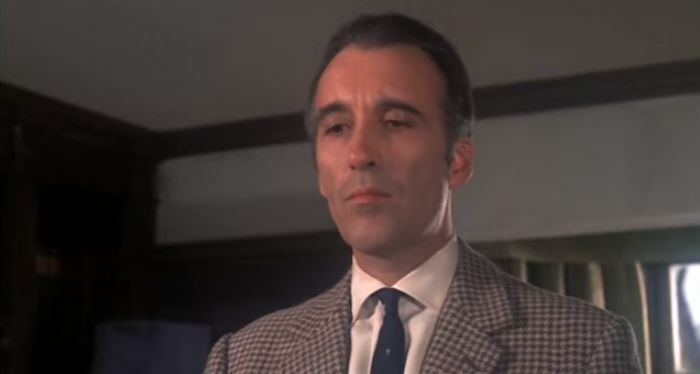 We then have a bit part cravat on Peter Madden as a rather surly manservant. Quite a drab affair befitting a man of his status. 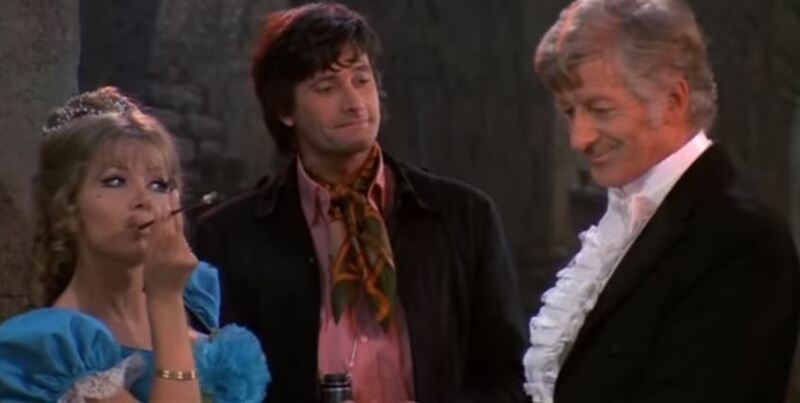 I think we’re seeing a theme here, that the cravat is befitting of the lower classes and the untoward; not the neckwear of a hero. 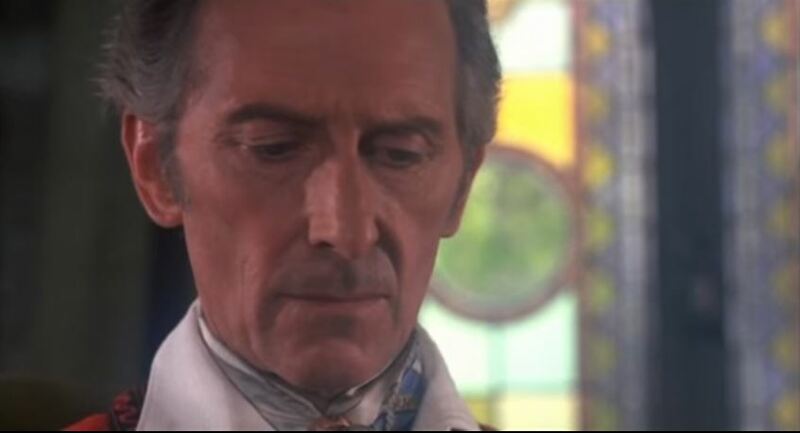 And finally for this film, we do have one of the heroes briefly attempt a cravat. But only briefly, and safely tucked away in a darkened room. 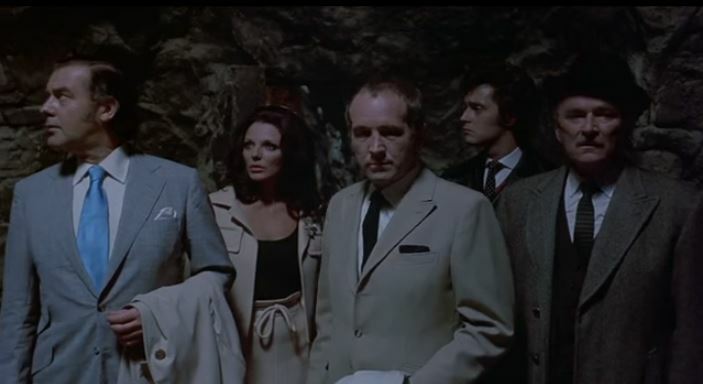 But we applaud Alan Freeman for his bravery (though the bespectacled chap doesn’t seem too impressed). 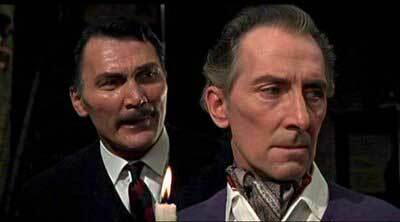 Next, we spring forward to 1967 for Amicus Productions second film in the series. 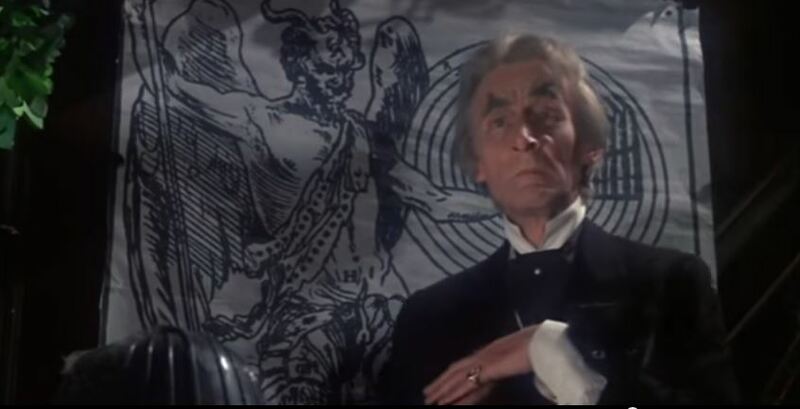 Again, we have rather scant pickings here and, again, it’s the villain of the piece with the cravat. 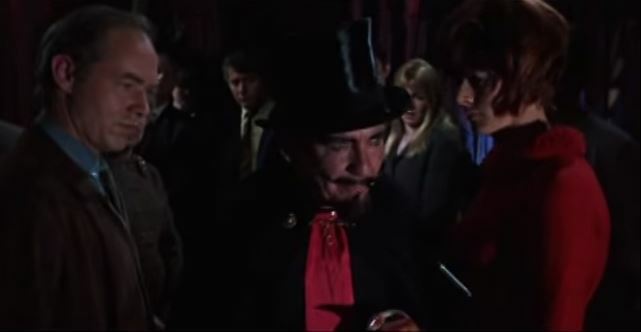 This time it’s Burgess Meredith as another doctor (though I’m not sure either of them were medically trained), Dr. Diabolo. 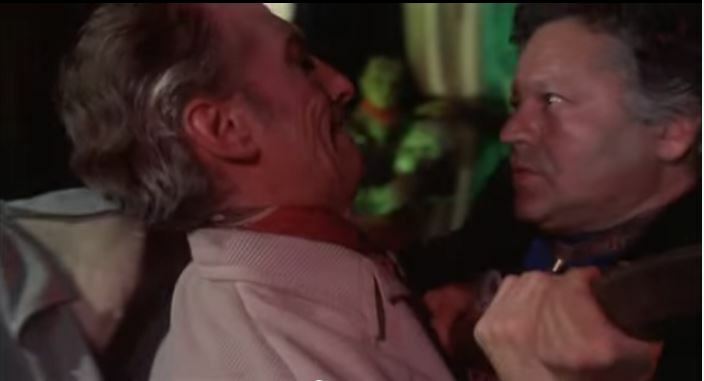 Tune in next time, cravatiers, to see Amicus really go to town with their neckwear. Doesn’t time fly when a life-size Victorian ventriloquist dummy becomes your lodger? Typical, isn’t it? 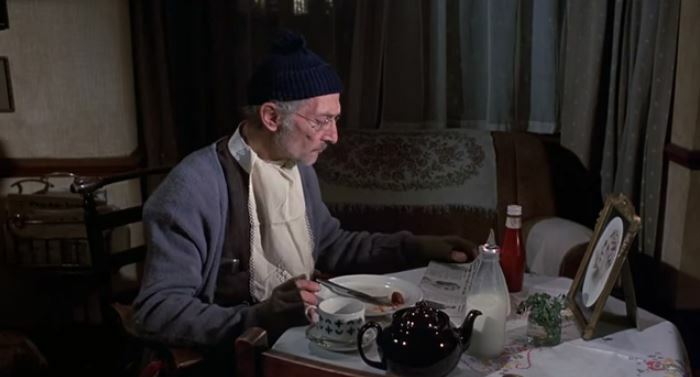 Everything’s rolling along nicely, you’re reading; writing about what you’re reading; you’re four books into a forty-five book blog series and it’s all going swimmingly and then you turn round and three months have disappeared. A quarter of a year, flown by without you even considering writing an entry on the blog. In fairness, I have been extremely busy in the day job (which is, weirdly enough, making custom leather-bound books for other people to write in!). But the main thing which has been keeping me busy is . . . errr, how do I put this? This is a life-sized, Victorian/Edwardian, fully working ventriloquist dummy head of a character called Ally Sloper. Naturally, we couldn’t let this old gent live out the rest of his days as a head so we set to building him a body. And we now have a 6′ 6″ Whitechapel born, ne’er-do-well living in the house. He’s over there now, in the corner, watching me write this. Just look at him sitting there! The problem is that Sloper was hugely (in)famous in his day. 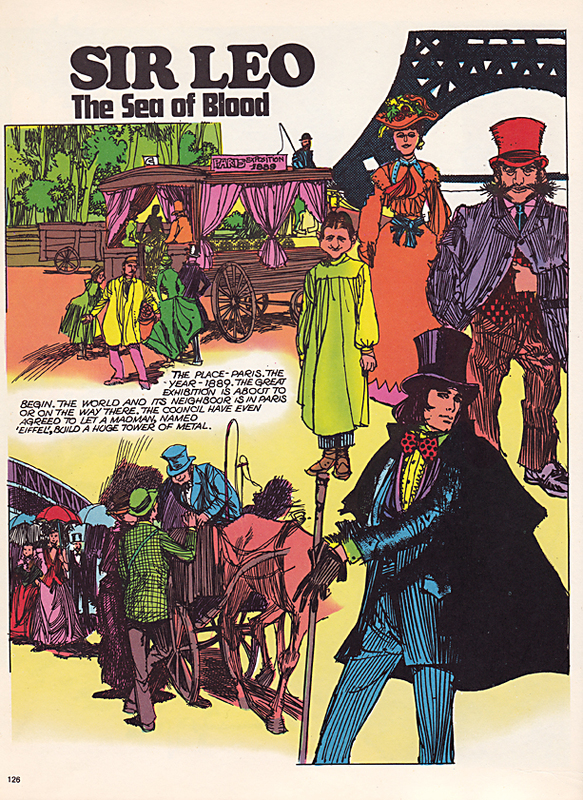 Massively popular for fifty years or so, he even had his own top-selling weekly comic journal entitled Ally Sloper’s Half-Holiday. Now though, he’s faded into obscurity and no one has heard of him. So, he’s set out to rectify that by starting his own blog and the fact that I’ve been helping him out with that has meant that I’ve been neglecting my own work here at When Churchyards Yawn. 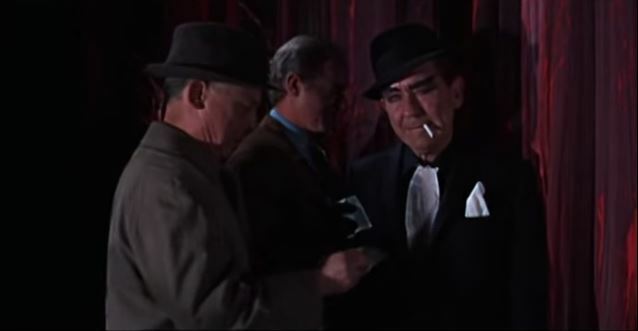 I do have a sneaky suspicion that, in the great tradition of Maxwell and Hugo from ‘Dead of Night’ and Corky and Fats from ‘Magic’, I’m sure the old sod Sloper is trying to take over. 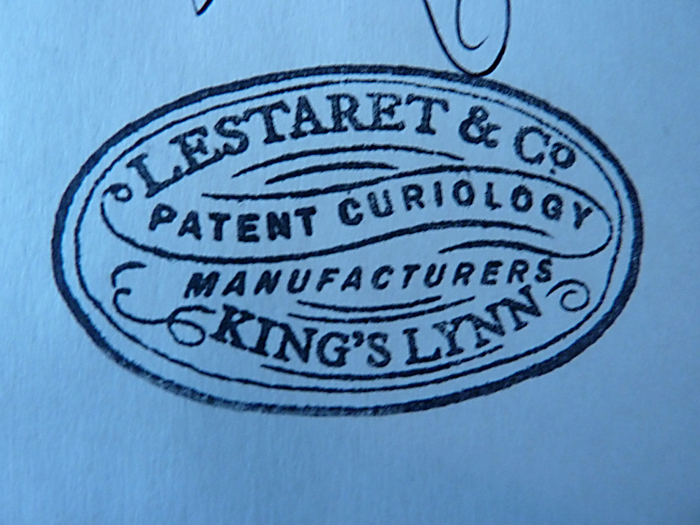 This post is definitely going in the Oddities & Ephemera category! Today we’re taking a bit of a diversion in The Churchyard. We’re taking a stroll away from the usual, neatly aligned shelves of horror paperbacks over to that dark corner, the one we rarely venture into, the one with the untidy shelves, the one we vaguely refer to as ‘miscellany corner’. There are all sorts of oddities lurking there, mostly things that are best left hidden. 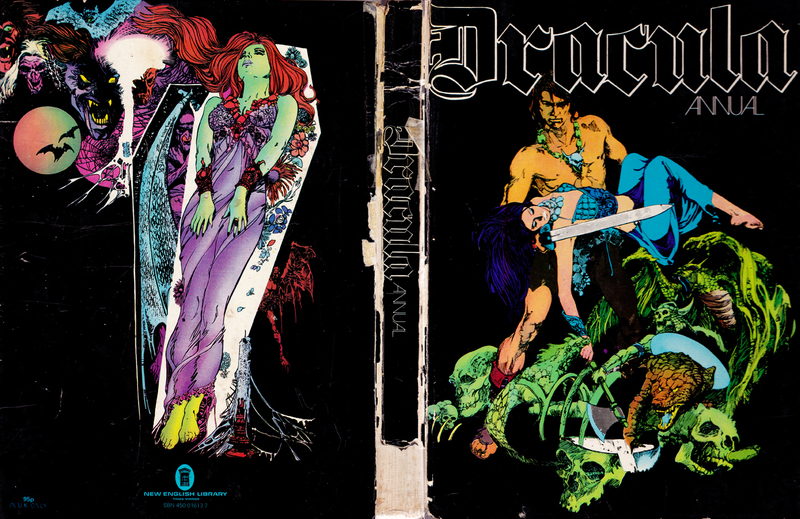 The tome I’m liberating from the darkness for today’s post is Dracula Annual, published in 1972 (I think, it has no copyright page) by the legendary New English Library. I found this one in a jumble sale when I was around 10 years old. It’s was in a sorry old state with the spine all broken and torn and the covers loose; it’s obviously still like that today, with the scraps of sellotape, now crispy and yellowed, hanging from its battle-wounds. In truth, I had trouble connecting with it when I was ten years old. 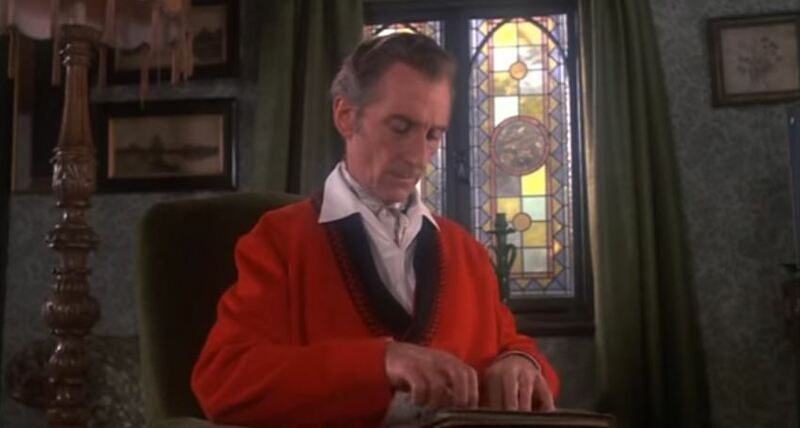 The contents weren’t exactly as advertised by the title, there being only one brief mention of Dracula in the whole thing, which was a huge disappointment for a child with an obsession for Hammer films. 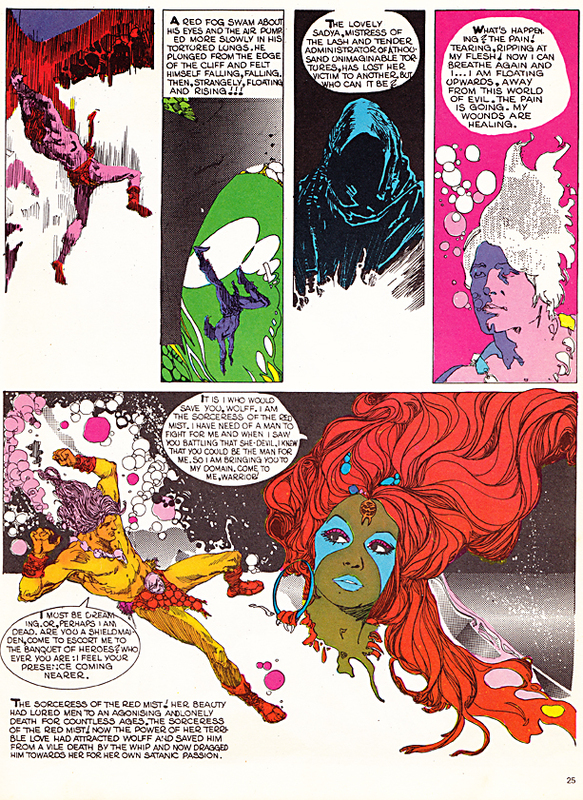 Instead there were just all these weird, brightly coloured images illustrating stories which didn’t seem to make much sense at all. So, the book was relegated to the back of a drawer and later, when I left my parent’s home, to a box. 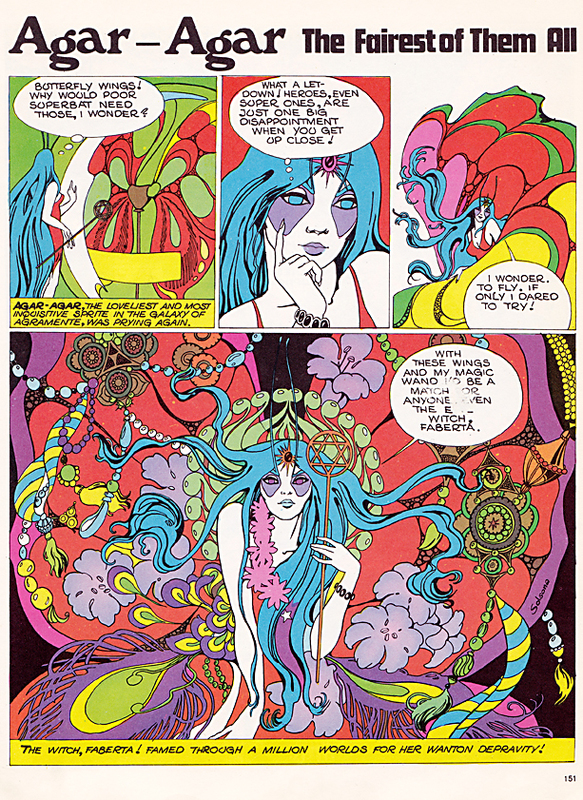 I rediscovered it in my late teenage years when I learnt to appreciate the *ahem* psychedelic nature of the contents. 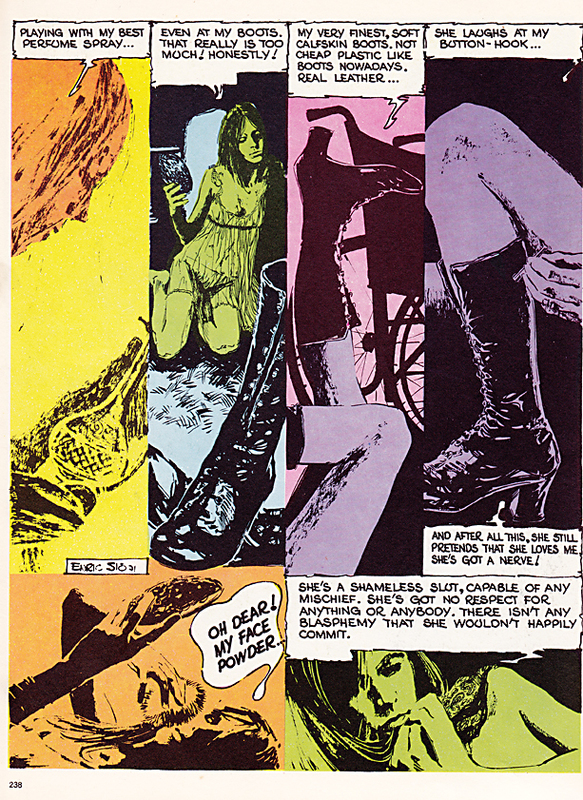 I spent many a happy hour getting lost within page after page of hallucinatory imagery. Ah yes, it all seemed to make so much sense now! 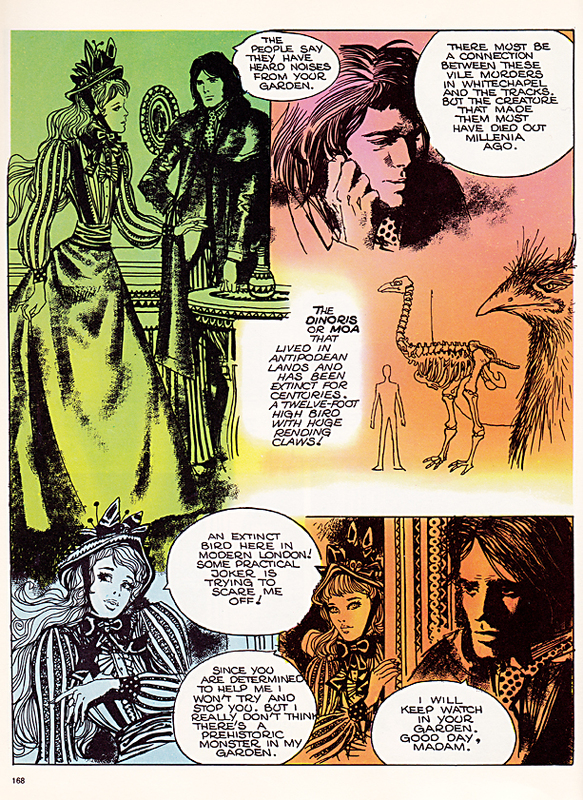 This is the main serialised story of the book and the only one which features in every issue. 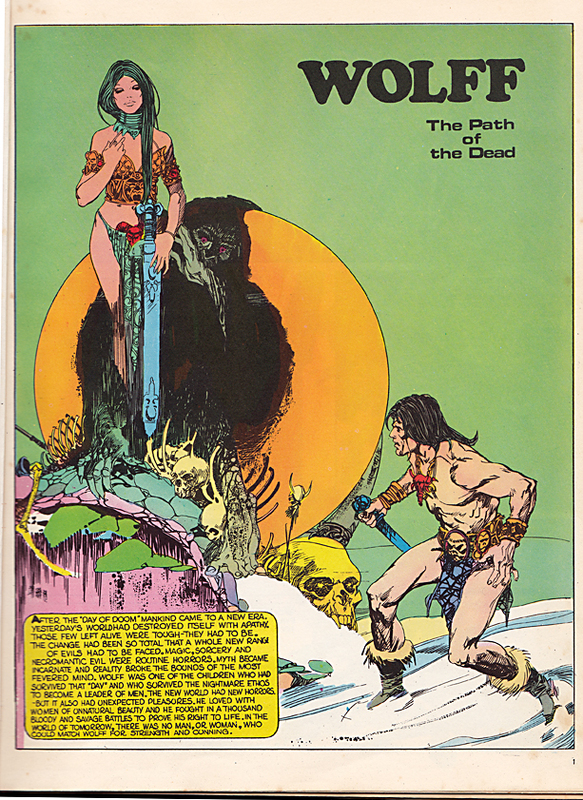 It’s a Sword & Sorcery romp which follows the adventures of the titular hero, a scantily clad barbarian with a penchant for furry boots and decorative pants. 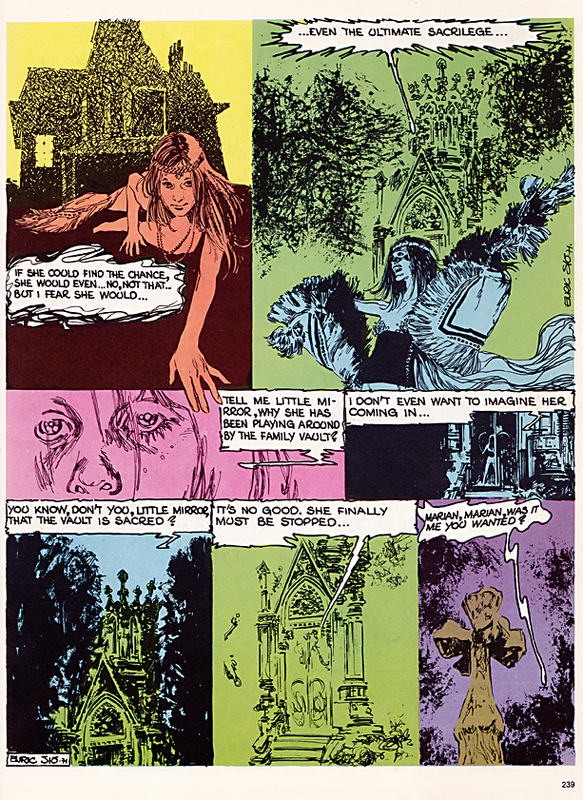 The story opens with Wolff returning to his tribal home after a hunting trip to find his village ransacked by The Witches. 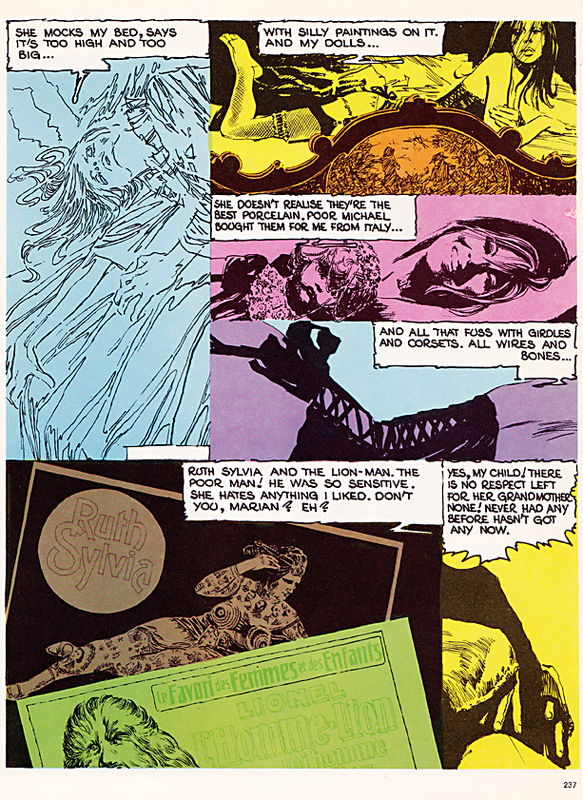 The young and the beautiful, including Wolff’s own wife, have been captured and all the rest left for dead. 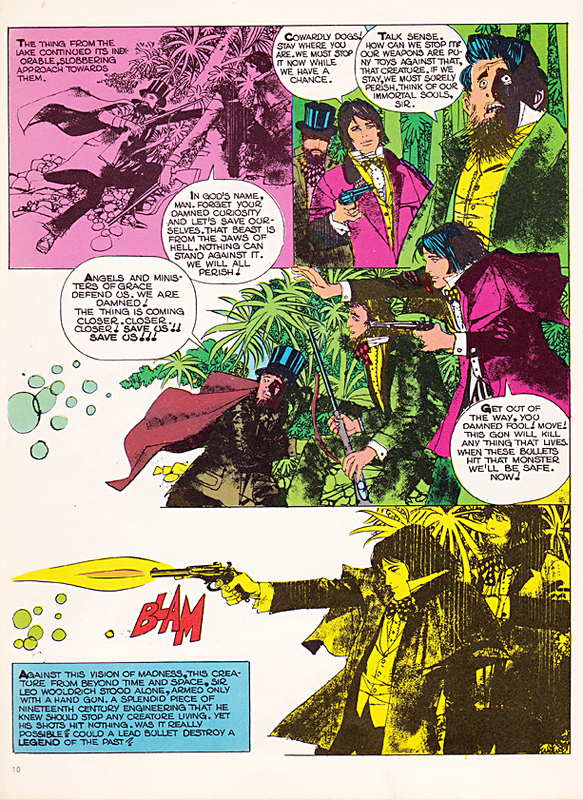 Of course, this sets in motion a tale of revenge as Wolff attempts to rescue his wife from the clutches of the enemy. It all borrows very heavily from Robert E. Howard’s Conan series and they don’t even hide the fact; on the second page we see Wolff invoke the name of Crom, a deity familiar to anyone who has read Conan. 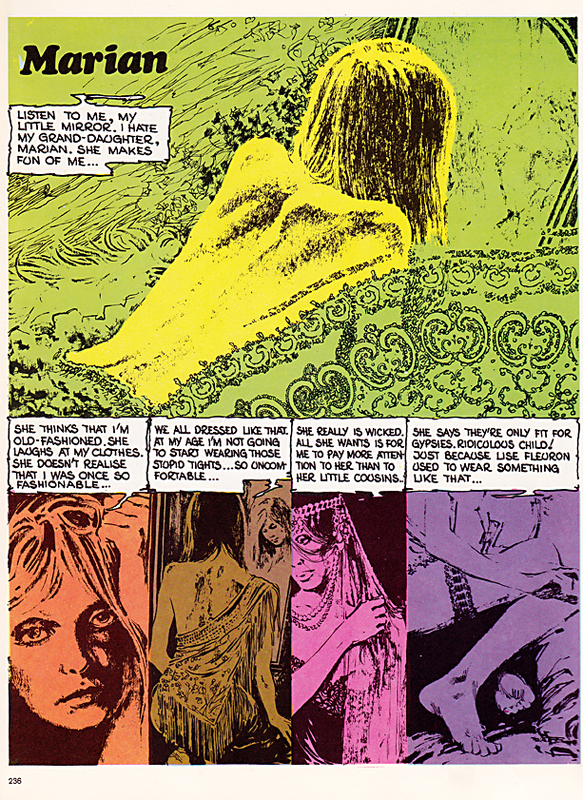 The artist, Maroto, went on to considerable success with Warren Publishing, having work published in their horror titles Creepy and Eerie. Sir Leo Wooldrich is a late Victorian English aristocrat who has rejected his social postion in favour of a life of adventure, a life of seeking out mysteries, a life of battling inhuman forces. 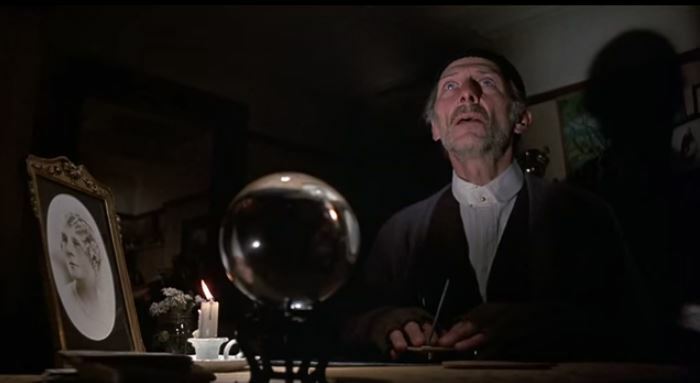 He is very much in the mould of William Hope Hodgson’s Carnacki and Algernon Blackwood’s John Silence, those early occult detectives we all love so much. These tales are mostly stand alone shorts and we see Sir Leo battling a variety of evils, including a hint of Lovecraftian terror when we see our hero consulting The Necronomicon in preparation for battle with one of the ‘Dwellers Beyond Space’ (an unnamed creature but possibly supposed to be Yog-Sothoth?). Sir Leo’s mentors are a pair of occultists with an expertise in Demonology, their names are Haining and James. 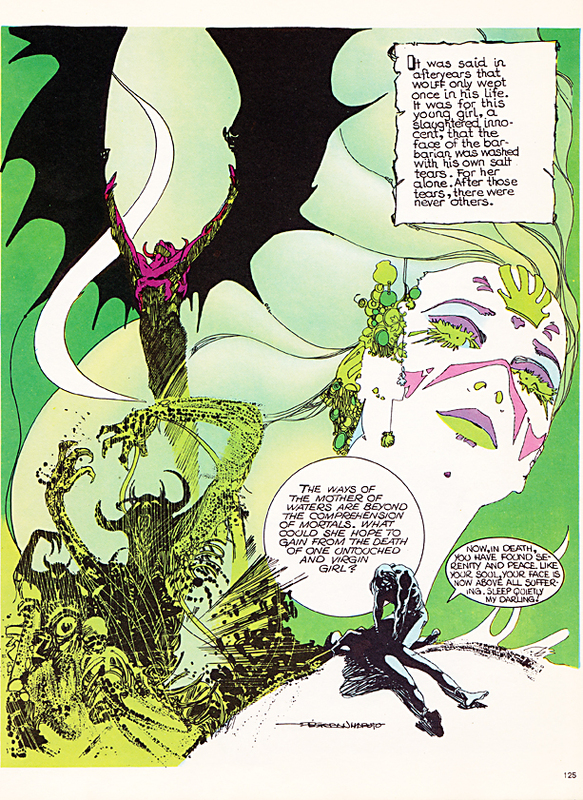 The author doesn’t seem shy of dropping allusions in here and there (I’ve already mentioned Lovecraft, there’s also an obscure reference to an early comic strip when he mentions Mehitabel and he even speaks of Charenton Asylum, the last resting place of The Marquis de Sade). So bearing this in mind, I wonder if he’s referring to others in the realm of supernatural fiction with mention of Haining and James! 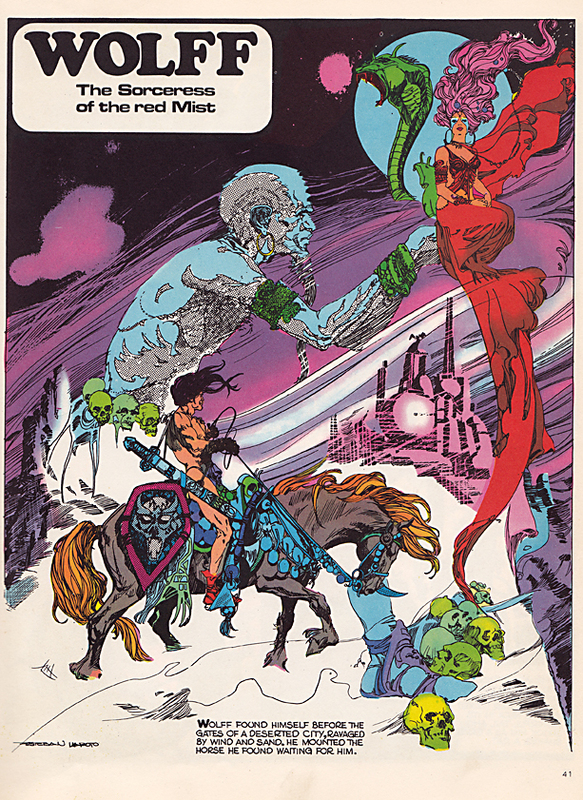 The creator of Sir Leo is José Beá, another stalwart at Warren Publications. As you can see from the contents list, he also produced a few one off Gothic horror stories for this book. 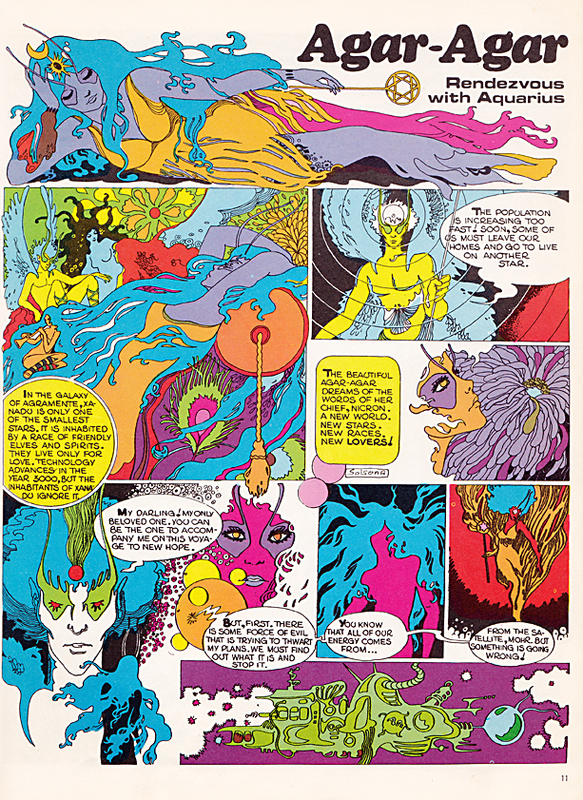 So, it’s free love all round in this surreal, hallucinatory and mind-expanding world. 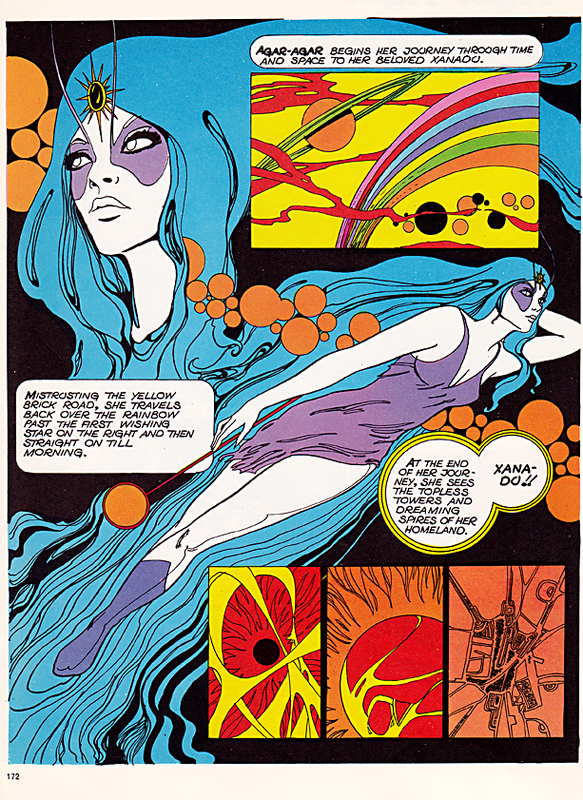 And while she’s travelling the psychedelic byways she also finds time to complete her task of saving her homeland from the evils of consumerism. In the final climactic battle she defeats (or rather talks her Blue Prince into defeating) the Seven Headed Dragon of Consumerism, each head representing one of the evils, Pollution, Inflation, Tobacco, Alcohol, Cars, Money and Misery. In contrast to the low-fantasy of Wolff, the slightly camp Gothic horror of Sir Leo and the…errr…whatever it is that Agar-Agar is, we have a single story in each issue by Enric Sió. These are surreal and disturbing tales made all the more creepy by his unique graphic style of inking parts of his illustration over his own photographs which adds a starkness to their terror. The visually bold world he creates is one of Giallo style horror with a slight hint of eroticism; a bleak world of strange and unnecessary deaths where nothing is resolved and nothing is explained. Rather than a few choice pages, let us have a complete story to give you a taste of the oddness. 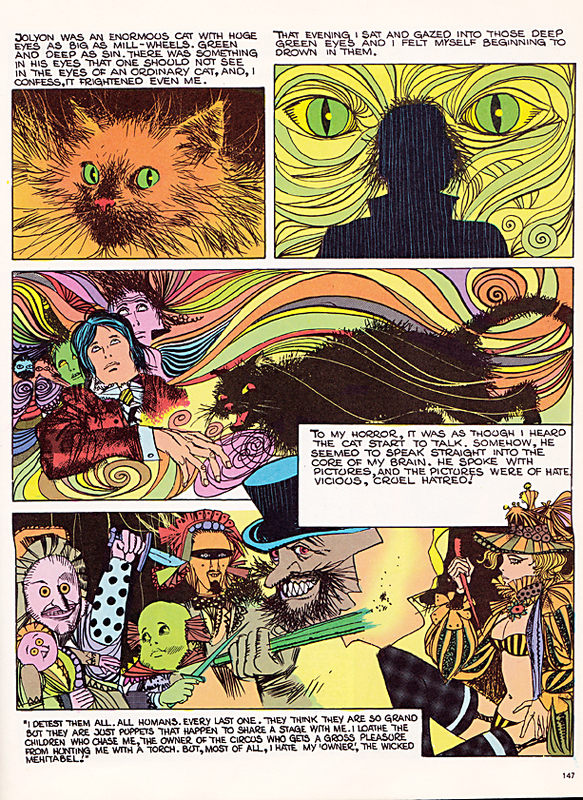 So, if you don’t have a copy of this book you could get a similar effect by dropping a few tabs of acid, putting Barbarella on one telly and Suspiria on another, Pink Floyd’s Relics or perhaps some early Gong on the stereogram and reading through some old copies of Weird Tales. If you do have a copy of this book then you’ve probably already done all of the above at the same time as reading it. A fun way to spend an afternoon or an eternity, wasn’t it? p.s. 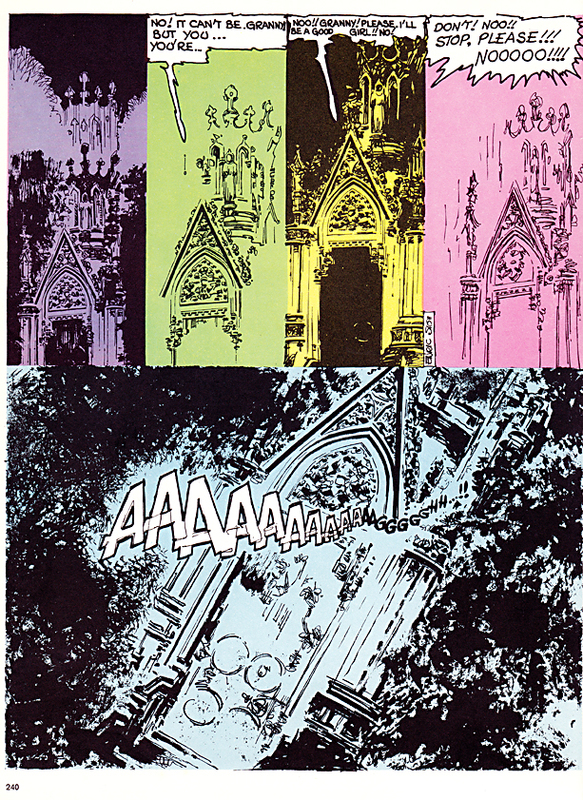 We at When Churchyards Yawn do not condone the use of hallucinogenics in any way, shape or form. p.p.s. That last disclaimer may not strictly be true. For this post we’re taking a bit of a break from the horror fiction. 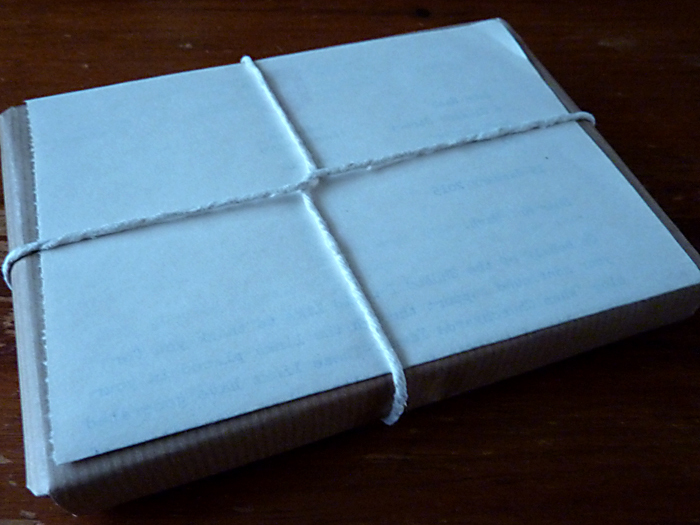 Well, reality slipped again this morning and I received another, slightly larger, unexpected parcel. 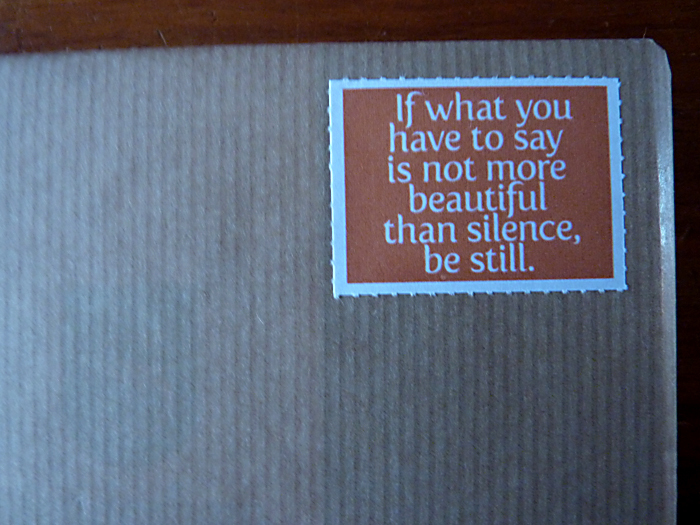 All wrapped up in brown paper and tied with string, with a quote from Confucius in place of the usual postage stamp. This had to be from the good folks at Soddenham, Norfolk. I carefully placed it on the table (after listening to it to make sure it wasn’t ticking) and gently teased open the knot in the string. 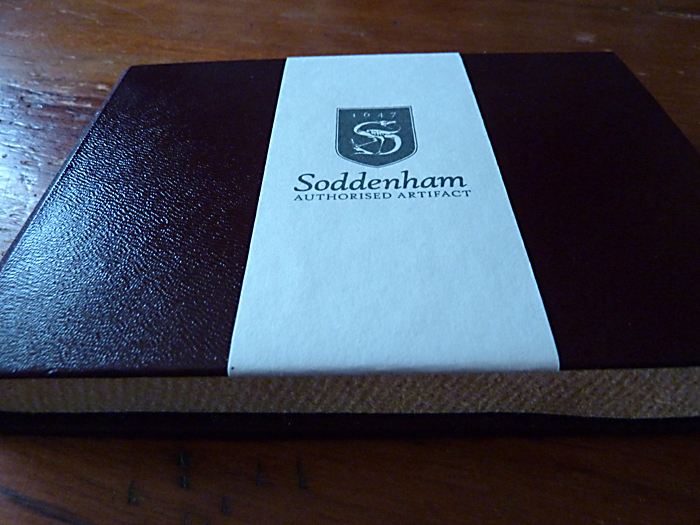 As the brown paper unfolded I was confronted with, what I thought at first to be, a beautiful handbound notebook with an oxblood cover. 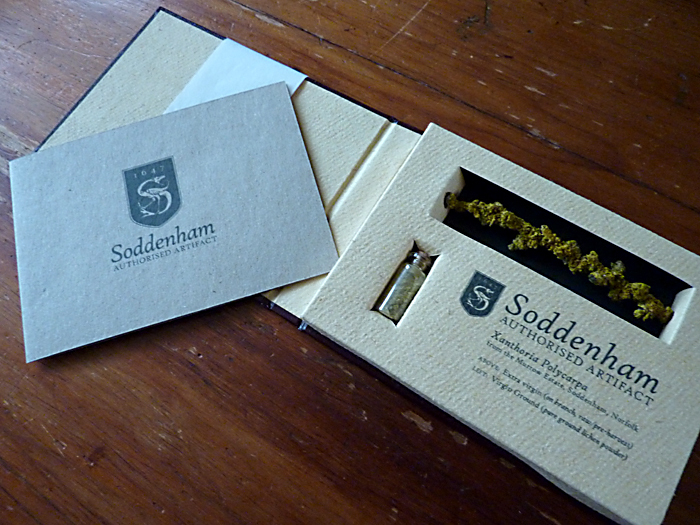 A paper label adorned the cover bearing the Soddenham crest. Along with this was a beautifully typed letter from, no less than, the chairman of the Soddenham Historical Society and Curry Club himself, Mr. Les Taret! On opening the notebook I discovered that – no, it wasn’t a notebook at all! 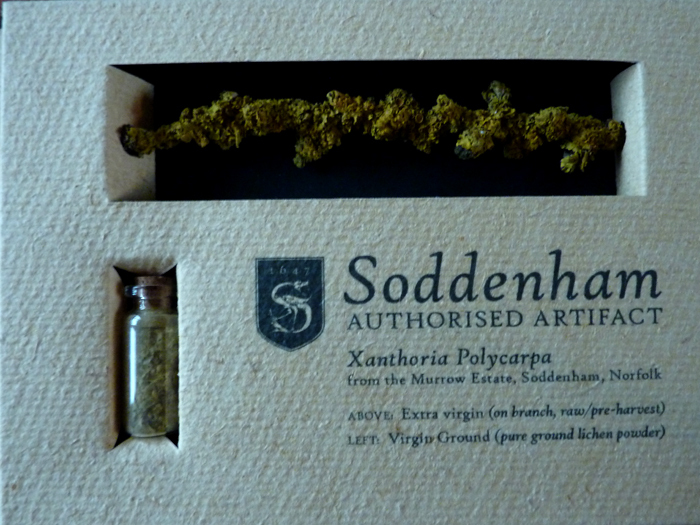 but a beautifully made presentation case containing samples of genuine Soddenham lichen, one piece of Extra Virgin, pre-harvest lichen (still on the branch) and another of pure ground lichen powder in a tiny glass phial. Sadly, due to the decline of the spume industry, Soddenham now has only one lichen orchard left, which is also the last one in England, as attested by the accompanying Certificate of Authenticity. In conclusion, I would just like to say a huge thankyou to Mr Taret and the other members of the SHSACC, Mssrs. Pardow, Drewery, Dengue and Thule and to the treasurer, Ms. Smokepipe. Also to Mr. Furcleby, the last remaining lichen husbandman. 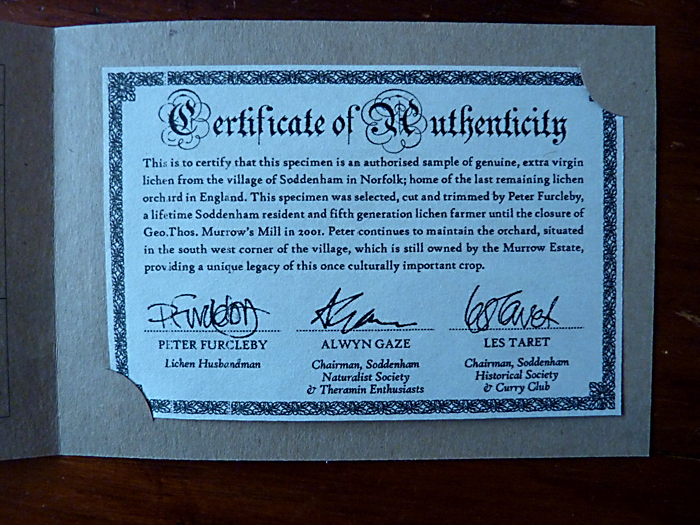 Thankyou all, I shall treasure this artifact; myself and Mrs Nash may well brush off our old Pashley tandem this summer and take a trip across to visit your wonderful village to experience the orchard for ourselves.